Dental emergencies can occur out of the blue. Having a few dental items on hand can help relieve the pain until you can get to a dentist. How many of us have dental supplies on hand? I’m guessing not very many of us. Dental emergencies can hit out the blue. Without a warning, pain and soreness can occur in the gums or teeth and cause an extreme amount of discomfort. Ensuring that you have some dental supplies on hand can help maintain healthy teeth and gums and assist in not further aggravating any existing dental problems. Be proactive and take the time to schedule regular dental visits and develop good dental hygiene habits, and in doing this, it will ensure that your teeth and gums stay healthy. When your family dentist suggests elective procedures, take the opportunity to the extra mile for your teeth because the last thing you would want to face during a disaster scenario is a dental emergency. Two proactive solutions to maintain good oral health is to floss regularly and to invest in a water pick. Charcoal – can make a compress that relieves swelling and pain. 1. Go to the dentist and get an annual check-up and cleaning. 2. Start taking a vitamin regimen that will assist in oral health. 3. Begin brushing your teeth for at least 1-2 minutes, and teach your children to do the same. 4. Floss at least once daily. 5. Read your dental emergency resource to be familiar with treatment plans. 6. 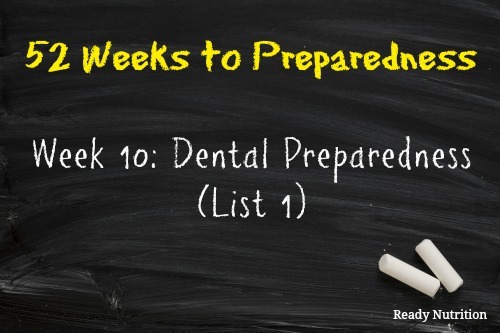 Read a dental emergency resource to be familiar with treatment plans. Note: If you plan to have older adults staying with you during a short or long-term disaster, do not forget to anticipate their dental needs. AGENDA 21It all adds up.Depopulation of the middle class is all a part of a plan.Sustainable development is another word for controlled growth. Charcoal should be in every first aid kit. It’s great for food poisoning, and many other types of poisoning (DO NOT use if a corrosive substance has been swallowed!!!) You must drink lots of water to avoid constipation. It can also be used to purify water. One thing that is absolutely critical and left off the list is Listerine, and ONLY the original gold colored stuff. We have used the generics for years with comparable effects. After meal brushing with listerine is absolutely essential for suppressing the dental biofilms associated with tooth decay. ALSO, if thre is a tooth ache, especially for the case of a recent cavity (we’re not talking about long progressed conditions that have reached the root pulp here, but here would be a paliative too), holding and sloshing the listerine in the mouth kills the bacteria secreting the acids causing the pain to exposed nerve tissue. Withing a half hour after treatment, the pain is gone or very nearly so. Continued treatment keeps the pain away. The smart will realize that any sugared food is wholey counter productive at the time. Listerinies, gallons of it, in storage. Good info. BUT, Fluoride rinse????? Seriously? ?